The Pour Moi Eternal Full Coverage Bra is fashioned in a delicate lace design, and its three section cup allows generous coverage, good support and lift. Underwired, with adjustable straps, hook and eye fastenings and bow detail to the centre front. 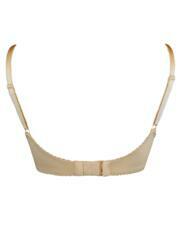 Featuring a semi-stretch neck edge and flexible comfort wire. This is amazing. The fit is perfect. Great value bra,one of my favourites now. Useless, no support at all. This bra is lovely fits perfect, got it in the sale at a great price. Lovely bra, really comfortable and supportive. beautiful Bra's and great fitting. Very pretty too. I have purchased this item previously and know that it is a good fit. I knew what the item was like as I have bought similar before. Nice style and it fits! It’s so difficult buying a decent bra these days. Love these bras. Very good fit and happy to find unpadded bra in my size. Wash well. Have 3 of these now! Consistently good fit and quality. Black doesn't fade after washing. Great product and good fit. As I am large busted this bra gives big great support and looks great. Good fitting bra, very comfy and pretty. Feel quality. Not worn yet. Great fit and very comfortable; however cannot wear under white tops. Great bra! And good delivery. Ab Fab best ever bra fits great. Lovely, great fit and look! Yeah great I have recommended this web site. Had to return as it was a tad too large. Good fit and very comfortable to wear. Great value for money. Again this bra suited my figure as it was a full cup. Great fit and was a full cup. Deliberately bought a bit too large, but good comfy bra around the house. Because they are very nice and they fit lovely. I have numerous identical bras in a variety of colours and just love the style and fit. The bra is very pretty, however the cups point sideways - not a good look for a big girl. Brilliant, this is a great fitting bra.